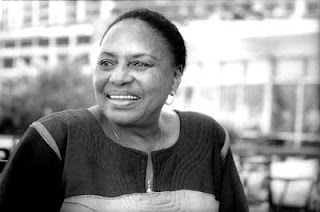 Film Studies For Free was very sad to hear news of the death of Miriam Makeba. As part of her monumental singing career she appeared in person and on the soundtrack of many films (including: Soul Power (2008); Bobby (2006); Transamerica (2005); Amandla! A Revolution in Four Part Harmony (2002); Sacred Sounds (2000); When We Were Kings (1996) Sarafina! (1992); Have You Seen Drum Recently? (1988); Amok (1982); and Come Back, Africa (1960), as discussed by Ntongela Masilela in a great 1991 article for Jump Cut). She so often embodied the sound of global, cinematic South-Africanicity. And, thanks in part to all her film performances, she will sing on for us. Haile Gerima: An African Film Master (Ntogela Masilela). Issues in the South African Cinema (Ntogela Masilela). Thelma Gutsche: A Great South African Film Scholar (Ntogela Masilela).